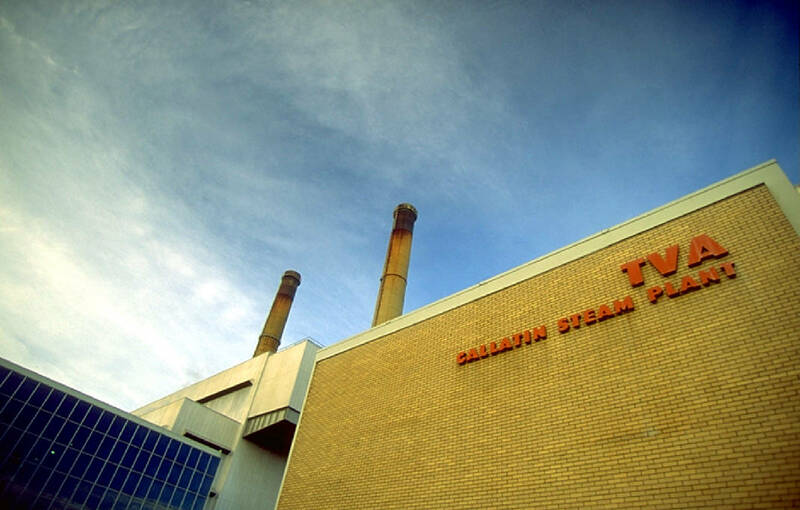 TVA's Gallatin Fossil Plant is shown in this file photo. The Tennessee Valley Authority said Monday it plans to appeal a federal court ruling that it dig up and remove coal ash buried at TVA's Gallatin Fossil Plant in Middle Tennessee. TVA lawyers filed an appeal notice in federal court in Nashville to try to pursue their case to the U.S. Court of Appeals, although the federal utility did not ask for a stay of the previous order or a delay in the August ruling by federal Judge Waverly Crenshaw ordering TVA to remove the coal ash at Gallatin. TVA argues the court-ordered method of cleanup for coal residues at Gallatin would take up to 24 years and cost $550 million using a lined landfill onsite, or up to $2 billion and possibly a different timeline with an offsite landfill. TVA spokesman Scott Brooks said capping and storing the coal ash where it is now would likely cost only about $200 million and still be as effective in limiting water pollution. But the Southern Environmental Law Center, which has challenged TVA's coal disposal methods, disagrees about the effectiveness of keeping the coal ash in place and contends TVA overestimates the time and cost of removing the ash. Crewnshaw sided with the lawsuit brought by environmental groups against TVA, ruling in a 123-page decision in August that the testimony in the case "conclusively establishes that coal ash constituents have historically been discharged into the Cumberland River" from the TVA coal ash ponds in violation of the Clean Water Act. Since April 1970, TVA has been sluicing coal ash waste to a 476-acre coal ash pond complex, which is also unlined. TVA is replacing all of its coal ash ponds at its fossil plants with dry ash storage facilities to avoid such water pollution problems. TVA President Bill Johnson said he believes installing lined ponds and capping the coal ash deposits is safer than digging up the ash and relocating it elsewhere. Johnson said in August that "courts are reaching different conclusions" regarding coal ash storage and an appeal of Crenshaw's ruling would help clarify the rules. Lloyd Webb, director of energy procurement for Olin Chlor Akali in Cleveland, Tenn., and chairman of the Tennessee Valley Industrial Committee, worries the multi-billion-dollar expense of removing coal ash from existing ponds could push up power costs for utilities across the country. In its court filings, TVA also challenged the claims by the Southern Environmental Law Center to recoup $2.7 million in legal fees the environmental group said it spent to pursue the legal challenge against TVA. TVA objected to requests by the plaintiffs in the case to recover their expenses for parking tickets, emailing reporters and rental cost for a conference room in a hotel TVA says is only a few miles from the Southern Environmental Law Center offices. But DJ Gerken, acting managing attorney of the Nashville office of the Southern Environmental Law Center, said TVA brought on such legal liability by consistently challenging claims made in court and not trying to negotiate a settlement. "SELC and many others have tried for years to get TVA to clean up the coal ash pollution it ignored for decades," Gerken said. "TVA rebuffed our efforts to amicably resolve this every step of the way, refusing negotiations that would have avoided a lawsuit and a full trial, forcing the courts to weigh in when other utilities were in the process of cleaning up coal ash sites." Gerken said TVA filed five motions to dismiss the case and fought expert discovery about the extent of the pollution. "This pattern continues: at the same time TVA announced it would clean up its Gallatin coal ash, TVA filed an appeal of the court order to do so, which will draw this case out even more," Gerken said. "It required massive expenses to take this case to trial and TVA is the one responsible for that."